Evgeny Kaspersky, founder and director of Kaspersky Lab, talks about business, internet security and how Jackie Chan helped fight cyber threats. Kommersant recently spoke to Evgeny Kaspersky, founder and director of Kaspersky Lab, about how Jackie Chan and some girls on skis in Antarctica helped fight international cyber threats. Kommersant: For many years you were in charge of your lab’s antivirus research while your former wife, Natalia Kasperskaya, ran the business. Today are you still involved with development or are you overseeing the company’s business strategy? Kaspersky: You can tell what I’m currently working on by the people working around me on my floor of the building. This is one of the best anti-virus experts and developers in the world. In other words, I’m most closely involved with development, new technologies and threats. I also travel a lot. I am increasingly invited to high-level government functions and conferences; I have appointments to keep in Washington and Brussels. And that’s good — the West and the United States need to get used to the existence of non-local Russian products. It’s a long process: Europe is already used to it, now the States are getting used to it, though it may take a few years. In Western Europe we have government and military contracts. We don’t have that yet in the States, there major corporations are absolutely disloyal to non-American products — I’m talking, of course, about the IT-security market — not to mention from countries that are not part of NATO. My intention is to change that rule, at least in part. It’s a very difficult problem, but it will be solved. That is one of my main focuses today. Kommersant: In 2009 Jackie Chan took part in an advertisement for Kaspersky Lab. Howdidyougethimtoagreetoit? Kaspersky: Our director in the Pacific region is an old friend of his. They studied kung-fu with the same teacher. Kommersant: Will you collaborate with Jackie Chan on ads in future? Kaspersky: I don’t know. It’s a matter of local marketing. Maybe in China, in Asia we will. Kommersant: Is the use of superstars in ads effective? Kaspersky: Actually it’s a very interesting thing, because the results are completely unpredictable. On the one hand, Jackie Chan, on the other, we sent some girls to the South Pole on skis, and flew there ourselves. Why would any normal person race off to the South Pole? To meet some girls! Then there was our partnership with Ferrari, and the IT conferences we held in Uryupinsk and Kozmodemyansk… I’m a fan of unusual projects. The more unusual they are, the better I like them. Kommersant: Have you received merger offers from other companies? 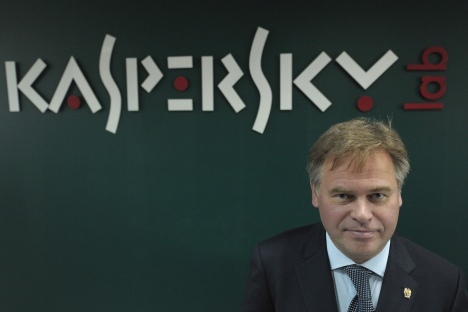 Kaspersky: People have wanted to buy us a number of times. Kaspersky: Why should we sell (Kaspersky Lab)? What’s the point? Kaspersky: But then it wouldn’t be our market share, it would be theirs. I’m far more interested in trying to achieve success on my own, in making my own decisions and being responsible for them, than in trying to convince some guy that I’m right. We need to preserve a certain balance between our immediate advantage and strategic investments. Take, for example, a protected operational system. When I talk to experts, when I talk to IT-security specialists, they understand why we need to develop that system. But to explain that to financiers is impossible. They don’t understand the scale of these things. It seems to me that in most cases taking a company public is the simplest way for the company’s owners and top management to collect their cash and tell everyone thank you and goodbye. That is not what I want to do. My company’s aim is to save the digital world. Not just digital Russia, the digital world. Because in the Internet there are no borders. Kommersant: So your refusal to take the company public is forever? Kaspersky: Never say “never”. What if a situation suddenly comes up that requires our going public? It could happen. I don’t rule it out. But it won’t happen in the next five years. Or perhaps even ten years. Or perhaps ever. After all, Michael Dell decided to turn Dell back into a private company. Right? Kommersant: What is your share in Kaspersky Lab? Kaspersky: I have a lot. Roughly 80%. I’m very, very based on majority. Kommersant: Recently the Secure Internet League, of which Kaspersky Lab is a member, proposed putting the Kostroma region on the “white lists” of Internet sites. That would basically be censorship, and it was criticized by Minkomsvyaz. Kaspersky: That’s a case where technology can be used to either help or harm the user. If you give the user the choice of being or not being included in the “white lists”, then it’s a good idea. There’s also “Parental Control”: you turn on the “white lists” and that’s it, you can relax about your child: let him look at what his mother and father allow. But as for forcing these lists on users, I’m against that approach. Kommersant: In December of last year Kaspersky Lab announced that it had uncovered a spy campaign called Red October during which sensitive data was stolen from state structures in Russia and the Commonwealth of Independent States. The Lab’s announcement was made the day before Vladimir Putin entrusted the FSB with fighting cyber crime. Was that a coincidence? Kaspersky: Do you seriously believe that we coordinate our PR activities with the president’s administration?